Pellay Maryvonne. « The Lion Hunt » by Eugène Delacroix: a cyclone in the land of color [Internet]. Version 1. maryvonnepellay. 2009 Déc 28. Available from: https://maryvonnepellay.wordpress.com/article/the-lion-hunt-by-eugene-delacroix-370200hmdst2s-211/. Claws out, brown, red, yellow, blue, green, black, the lions roar, attack, rear, fall, roll. A flamboyant dance where the forms join as one, where the curves meet in a virtuoso flurry of action. The passion in this sketch unseats our regard, throws it to the ground, hurling it into the heart of the action. Looking more closely, isn’t it the color that is doing the lion’s share in this picture? ‘The Lion Hunt’ is a preparatory study for the great canvas that Delacroix presented at the Universal Exhibition in 1855. Sent to Bordeaux, the final work was damaged by a fire at the Town Hall in 1870. While he was travelling in Morocco, Delacroix was restricted to watercolor. He kept this preparatory study at this stage, even leaving several bands of the support visible. The rhythm of this preparatory sketch is vertiginous ; the brush races headlong across the canvas. A thin layer of paint leaves the support showing on the edge of the picture; the horseman and the rocks top left. Delacroix has organised the composition around a diagonal that traverses the canvas. It disappears in the chaos of form and color that creates the dynamic of this whirling movement. Delacroix worked his preparatory studies according to the technique employed by Rubens, who used much-thinned Sienna and burnt umber in all his preliminary works. While Rubens stopped there, Delacroix took a step further and introduced black as his darkest color and white as his lightest. The light is focused on the bodies of the two lions and the rearing horse in the middle of the composition. Crucial to this whirling movement, it describes the three curves made by the three animals and finds a resonance in the splash of light on the ground where an unseated horseman is picking himself up, in the middle, at the bottom of the canvas. An arabesque following the movement of the horse emerges from the center of the work. The pale form of the horse stands out against the dark background and brings out the central arabesque. The oblique positioning of the empty spaces draws attention to the top left, reinforcing the diagonal of the curve of the horse. The light is focused on the bodies of the two lions and on the rearing horse in the middle of the composition. Delacroix’s love of movement in painting is well-known. He made this discovery no doubt in Morocco, where he had to use watercolors to quickly record any scenes that interested him. 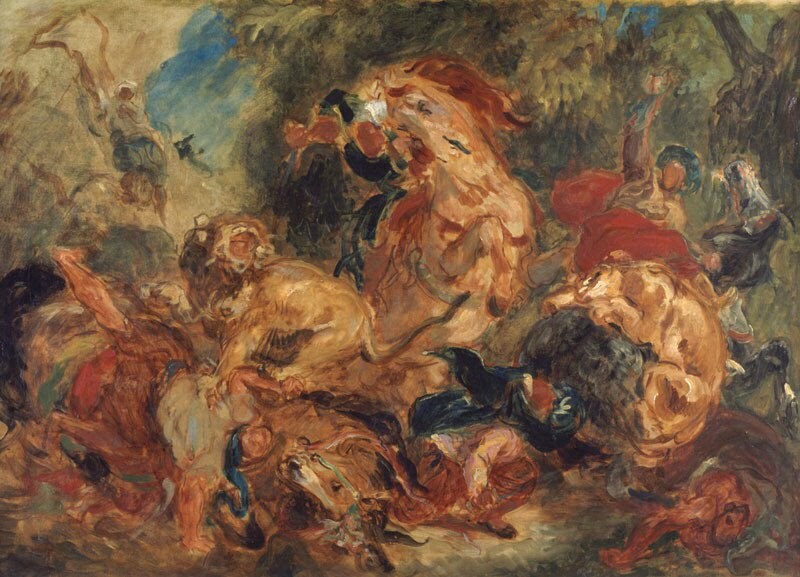 Delacroix treats one of his favorite subjects with masterful skill: a combat between wild animals and turbaned horsemen, with a strong oriental flavor. This is the pretext for a whirling of curves and counter-curves in an explosion of color. We can see two arched forms that echo one another, the horse in the centre and the lion hanging onto the other horse’s flank, to the right. The brushwork conveys the dynamic of the curves and counter-curves, following the volume of forms, as well as echoing or counteracting curves, as is the case for the horseman’s black clothing. Delacroix’s deft brushwork brings out the spontaneity of his medium. This preparatory sketch is a masterly demonstration of his skill – the way in which he positions the elements in the picture, without worrying about accuracy, optical depth, or modelling. Cezanne was to say, later, ‘do not model, but modulate’. In this work, Delacroix modulates his subject. It’s the pure delight in movement that appears here, the savage joy of painting. To the left of the picture, the brushwork is swiftly and freely executed, whirling and spinning; volume is modeled by the brushwork. Baudelaire was struck by the explosion of colors in the final work : ‘never have colors so beautiful, so intense reached the soul via the eyes’…The expressive force of the color, the dynamism of the forms, make Delacroix the master of Romanticism. The forms contribute to the dramatic nature of this hunting scene. In its powerful use of color, this work prefigures in twentieth century painting, from Kandinsky to Pollock. This sketch appears in every Delacroix exhibition. And rightly so. It prefigures the powerful color of twentieth century painting, from Kandinsky to Pollock. The forms contribute to the dramatic nature of this hunting scene. In this preparatory sketch, the artist invites us to witness a violent spectacle. Delacroix, who was fascinated by animal savagery and splendour, gives himself free rein in this canvas, with a kind of ferocious virtuosity that was ahead of his time. The color is flamboyant, dominated by harmonies of yellow, orange, brown and red, electrified by a few touches of blue and green to convey the heat of the battle. The two red and green groups on either side of the climbing oblique line create a chromatic tension. The painter has not covered the canvas with a uniform color; he makes the colors stand out by putting very similar hues on top of one another.